Dr. Maria Millan serves as the President and Cheif Executive Officer of the California Institute of Regenerative Medicine. Dr. Millan is a physician-scientist who has devoted her career to treating and developing innovative solutions for children and adults with debilitating and life-threatening conditions. After receiving her undergraduate degree from Duke University where she first entered the arena of immunology research, she returned to her home in New Jersey where she obtained her M.D. degree and then went on to complete her surgical training and post-doctoral research in Boston at Harvard Medical School – Beth Israel Deaconess Medical Center. After a transplant surgery fellowship at Stanford University School of Medicine, she began her academic career with a busy pediatric and adult transplant surgery practice focused on technical advancements and optimization of patient outcomes. In parallel, she continued her bench research at Stanford and was promoted within 5 years to associate professor and director of the Pediatric Organ Transplant Program. She served on multiple leadership teams including the Faculty Senate and the Dean’s faculty committee at Stanford University School of Medicine and served on the Children’s Hospital operations committee. She has published in the areas of cell biology, immunology and clinical organ transplantation. With early signals from the science that stem cell and regenerative medicine therapy was the new frontier for medicine, she ventured into the private sector in 2006 to join StemCells, Inc., one of the earliest stem cell organizations and the first to enter into an FDA-regulated clinical trial with a stem cell treatment for children with a fatal neurodegenerative disease. 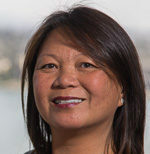 Dr. Millan then joined the California Institute for Regenerative Medicine (CIRM) in December 2012 where she led the formation of the Alpha Stem Cell Clinics Network, a network of California medical centers that specialize in rigorous and high-quality clinical trials and top-tier medical care for patients participating in these trials. This clinical network is successfully supporting over 45 clinical trials and was recently expanded to include 5 programs composed of 7 medical centers and their affiliated hospitals. As a key component of CIRM’s bold5-year strategic plan launched in 2016, which was designed to accelerate stem cell treatments to patients with unmet medical needs, Dr. Millan led the development of critical infrastructure, including specialized regulatory, preclinical research, manufacturing, and clinical operations support for stem cell and regenerative medicine trials. In July 2017, Dr. Millan took on the role as president and CEO of CIRM, and she was formally appointed by CIRM’s board in September 2017. Under her leadership, CIRM continues to drive the mission of accelerating stem cell treatments to patients with unmet medical needs, is on track to achieve its 5-year strategic plan, has now funded a total of 45 clinical trials and is continuing to grow this robust portfolio of high-quality programs by the month.